GSM Switch GS300 - IQtronic technologies Europe s.r.o. 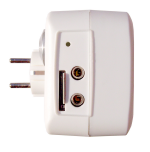 GSM Switch GS300 is designated for controlling connected appliance by Mobile Phone (SMS, Ring on). GSM Switch has temperature sensor, thermostat function, alarm input, real time clock, microrelay output, microphone for tapping. 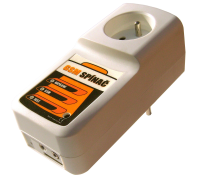 Output is wall socket 230V / 10A. After sim card insertion is GSM Switch GS 300 prepared for use. • With extenal sensors: motion detection, gas detection, door watch, outage monitoring with history. • Outage alarm with UPS. • Can be controled by SMS from Internet.